The foliage consists of rosettes of dark green, serrated leaves. Ovate buds emerge from the center of the plant. Flowers are bright yellow and can either bloom close to the ground or rise on stems a few inches tall. Dandelions have a long, strong taproot that extends several inches into the soil. Dandelions are perennial weeds. Their long taproot keeps the plant alive over the winter, and also makes it somewhat difficult to remove. 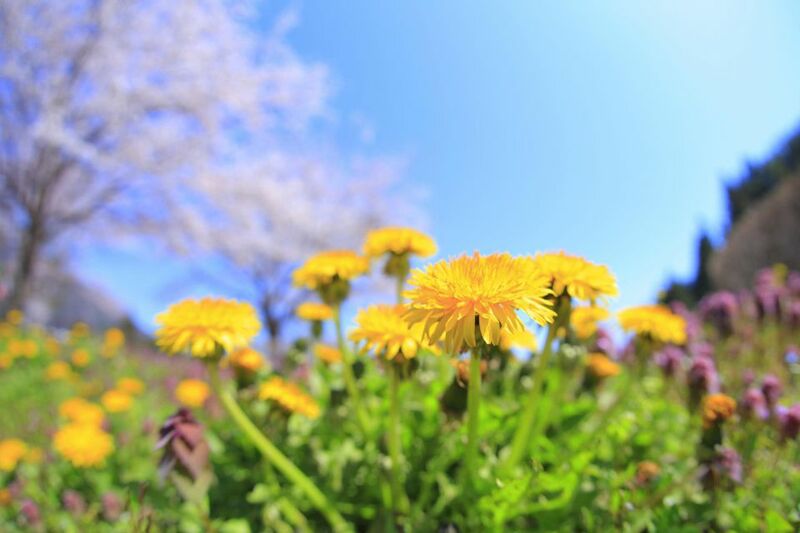 Dandelions spread by seed, which are dispersed by the wind and by sticking to clothing, shoes, and animal fur. The best way to get rid of dandelions is to remove them by hand. The key is to get all, or as much as possible, of the long taproot, since the plant can regenerate from any root pieces that remain in the soil. Water the area the day before you plan to weed, then use a long, narrow tool, such as a flat screwdriver or dandelion digger. Insert the tool as deeply as you can next to the crown of the dandelion, and wiggle the tool to loosen the soil around the root. Test to see if it is loose by gently tugging on the plant. Once there is little resistance, pull the dandelion out of the soil. Soils with low levels of calcium, and that don't break down organic matter quickly, are havens for dandelions, especially in lawns. If you have a lot of dandelions, top dress your lawn in the fall with compost. This will improve the nutrient level and introduce microbes that will break down organic matter more quickly. In addition, mow your lawn high and use a mulching mower to leave your clippings on the lawn. Try to remove any existing dandelions before they go to seed. For garden beds, a three-inch layer of mulch will usually prevent dandelions from popping up. Dandelion greens are high in iron and vitamin C. They can be eaten raw, steamed or sauteed. They are a delicious bitter green. In addition, the yellow blooms of dandelions are important late-season nectar sources for beneficials such as bumble bees.